"I noticed that most (all?) the pizza sauce recipes call for either tomato paste or tomato sauce or both. I wanted to do it from scratch! So I experimented until I got it right. This is much better than the store-bought sauce with none of those nasty preservatives." Place tomatoes, water, and olive oil in a blender or food processor; blend until smooth. Transfer tomato mixture to a large pot. Stir sugar, garlic salt, and vinegar into tomato mixture and bring to a boil. Reduce heat to medium-low and simmer until thickened, 1 to 2 hours, stirring occasionally. 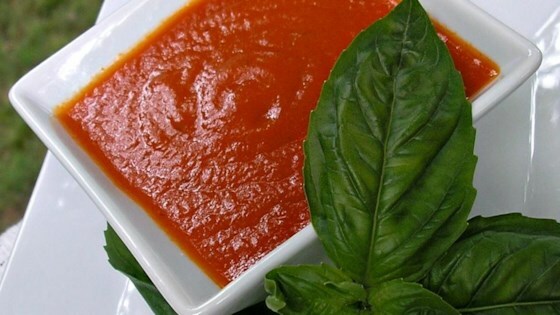 Pour tomato sauce into a clean blender or food processor no more than half full. Cover and hold lid down; pulse a few times before leaving on to blend. Puree in batches until tomato sauce is very smooth. This should yield enough for about 8 12-inch pizzas where you need about 6 tablespoons sauce per pizza. You can put what you don't use in plastic bags in the freezer. I put 6 tablespoons sauce into 8 separate bags. Just run hot water over the bag to thaw. I did not care for this recipe. Far too sweet. I've tried this recipe in the past and my only complaint is that it is a little sweet. I'm going to try it again today and ex the sugar. My suggestion now is to hold off on garlic salt and sugar until the end, and then add it to taste. It's WAY too salty! Great start to a basic recipe.